A sparge arm (copper ring) exposed above a grain bed. Keep this below the level of liquid to conserve heat. In all-grain brewing, continuous sparging is the practice of rinsing your grain bed with hot sparge water such that the inflow of water from your hot liquor tank matches the outflow of wort from your lauter tun. Sparge water is added so that the top of the grain bed is always covered with about an inch (2.5 cm) of water, except perhaps near the end of wort collection. Continuous sparging, also called fly sparging, is sometimes seen as too complicated or fiddly — especially compared to simpler techniques like brew in a bag (BIAB) or batch sparging. However, it does not have to be. Here are three fly sparging tips. 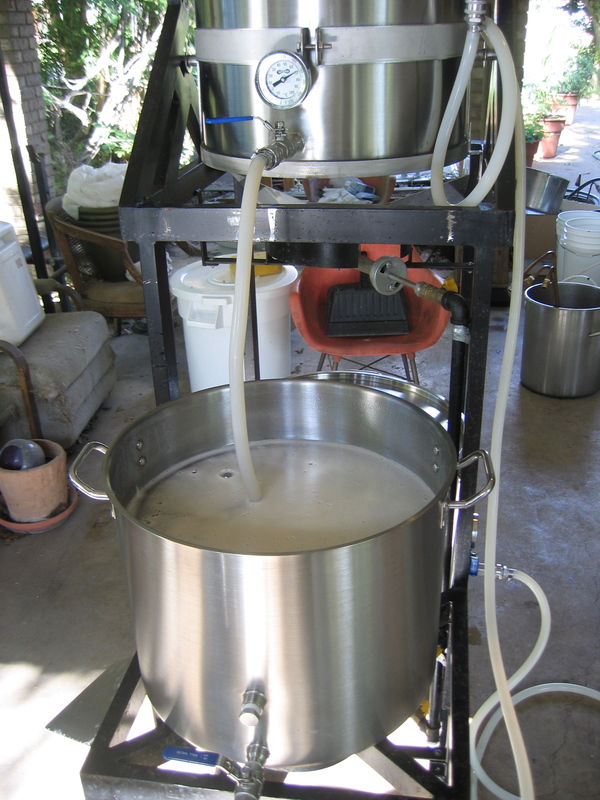 When I started all-grain brewing, I had a cobbled together system with a “whirlygig” sparge arm. When water ran through the sparge arm, it spun like a lawn sprinkler and sprayed the top of the grain bed with water. Getting the rate of inbound sparge water to equal the outbound rate of wort was something that took constant monitoring. I was constantly adjusting ball valves or hose clamps. What I didn’t realize until later was that getting the two rates to match exactly isn’t the end all be all of fly sparging. As long as you keep some water on top of the grain bed, everything is fine. So, I started to “pulse sparge,” which is just a name I made up for a common practice in commercial brewing. In pulsed sparging, I’d add a fairly large amount of sparge water to the top of the grain bed, so that the water standing on top was perhaps 2 to 3 inches (5–8 cm) deep, then wait for the water to almost fall to the level of the grain bed, then add another dose. When I did that, I only needed to worry about the sparge water every 5–10 minutes, and I could focus my attention on running off the wort at a reasonably steady rate. I also came to realize that “sprinkler” type sparge arms, in which small droplets of sparge water fall through the air before hitting the water resulted in these droplets cooling substantially before they hit the mash. Now I try to either simply pour my sparge water in, or use a sparge arm that sits under the water atop the grain bed. That and realizing what temperature my sparge water should be has helped me collect the wort more easily and with better success. 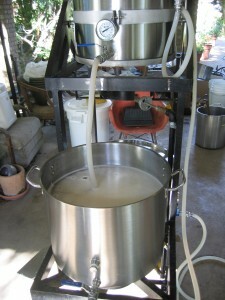 When I first started all-grain brewing, I heard about homebrewers sparging for 90 minutes, or in some cases as long as 2 hours to get the best extract efficiency possible. What experience has taught me is that longer sparges are only slightly more efficient than shorter ones. If you are looking for a place to shorten your all-grain brew day, here is one of the first places to look. I now shoot to collect my wort in about 60 minutes most times I brew, but have rushed things to 45 minutes with no large negative consequences. This wort is just short of boiling, right before the kettle is full. After my 90-minute wort collection sessions, I used to then turn on the burner and start heating the wort. It took me way too long to realize I could be heating the wort throughout wort collection. Now I turn on my burner once I’ve got a couple gallons in the kettle. I keep heating and take the temperature of the wort as it heats. I adjust the burner so the wort starts boiling right when I stop collecting wort, or slightly before. If you have a lot of wort to boil off, as in a big beer, you can bring the wort to a boil even earlier (especially if you don’t mind the wort picking up some extra color). Question Chris, if you heat the wort collected in the kettle while you are still sparging, does it effect pre-boil gravity readings at all? I assume as long as you don’t let it start boiling before fully collected, then it would be fine? If you evaporated any of the wort, it might. Your pre-boil OG would be a little high and your pre-boil volume would be a bit low. If you start boiling a little early, I don’t think there’s any problem with that from a beer quality standpoint. I’ve never understood why people even use sparge rings etc if they allow water to rise a couple inches above the grain bed anyway. I understand their use if the grain bed is exposed and you want to avoid channels and even out saturation etc, but otherwise why? Another time saver I want to implement is a float valve. Sparge rings distribute the water a bit, so it doesn’t channel into the grain bed. I am very much a no-sparge, brew in a bag, or batch sparge brewer. I have always felt (and continue to feel) as though fly sparging is too much effort for the homebrew scale. Why should I consider fly sparging? What does it really buy the home brewer? Thanks Chris. The biggest potential benefit is a higher extract efficiency. Also, compared to BIAB, you get significantly less trub in your beer. I’m moving from BIAB to a 3V setup. 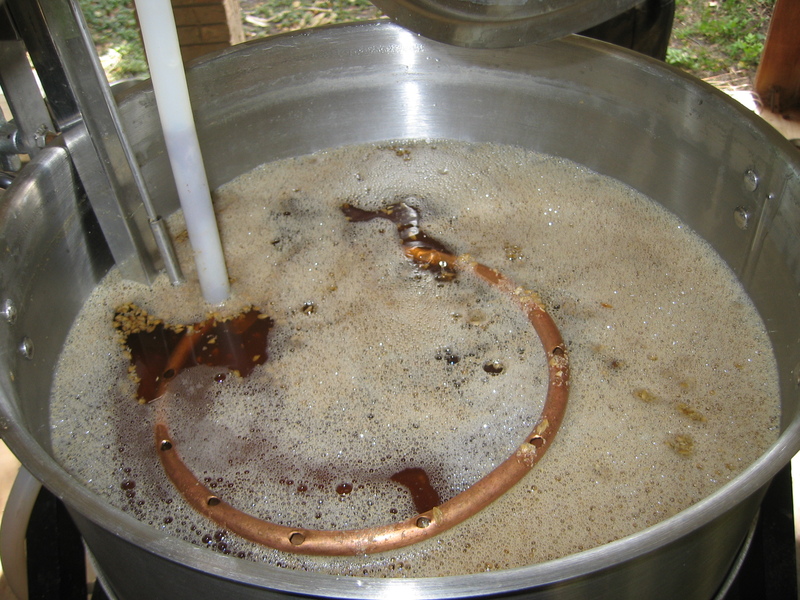 In John Palmers book he has an appendix on lauter tun design and for each option, be it braid or copper pipe manifold he says whether it will be good for batch, fly or no-sparge. I’ve bought a 10 Gallon Igloo cooler and I have a straight braided mesh. I am I limited to batch or no sparge only or can I use your pulsed sparging technique? I’m trying to change my process as my beers have been good but not stellar and I don’t want to essentially do a BIAB in a cooler and spend more time for no better result. If a false bottom or copper manifold is the way to go then that’s what I will do. What would be the issue if to much water was used in the fly sparse. What I mean is that the water never got down to just above the grain bed. The mash tun was basically full the whole sparge. It wouldn’t negatively impact the beer, but it makes the mash tun clean up longer (because you have to drain the unused water first). Its always good to have more sparge water. I stop sparging when I collect my pre-boil volume. I dont monitor the gravity to see if wort falls below 1.0.19 (tannins) as it never does. I do take a pre and post boil gravity for notes, along with post fermentation. I’m new to all grain and just purchased equipment to do all grain. I want to do fly sparring but I’ve yet to see any real detailed steps. Do you drain what’s in your mash tun till you can see the top of your grain then start sparging? At what point do you really start fly sparging from the HLT?